My favorite tea blend does not come in prepared tea bags. 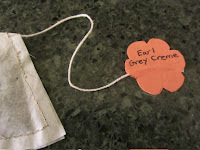 To make a pot, I have 3 choices, use tea balls, use a tea strainer, or fill empty tea bags. 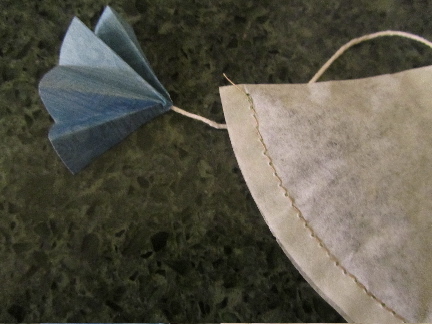 You can buy empties from places like Teavana or Amazon, for about $3-$5 for up to 100 bags, or you can make your own from coffee filters. Using one small basket coffee filter (for a coffee maker that brews 4-6 cups), I can get 3 bags, making my price per 100 bags about 35 cents. My sewing machine sits out in the guest room these days. I can whip up about a dozen bags in about 15 minutes. Why bother making my own bags to save a few dollars? 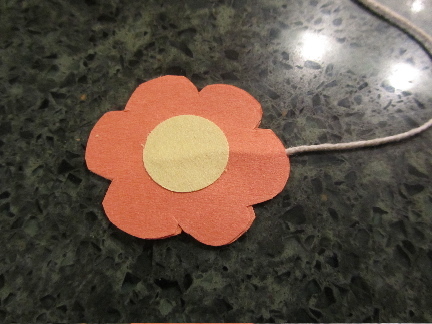 Well, because it's just the kind of crafty-craft thing that I love to do. Also, I can make my own bags really cute, to give as fun, little, "I'm thinking of you" gifts, or put out when friends come over. And, I usually have coffee filters on hand, these are very easy to do, and I have a very large supply of loose tea, both traditional tea, and herbs that I grow in summer for my own herbal concoctions. 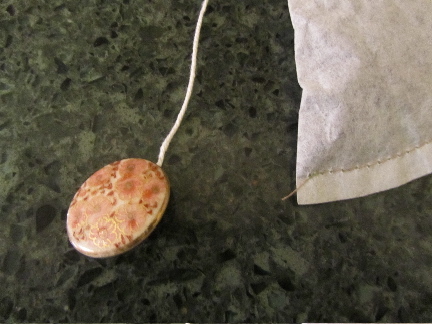 Finally, I'm lazy and don't always want to wash out a tea ball right on the spot, to make my cuppa. 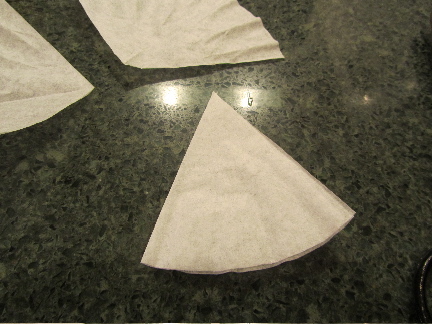 I cut my coffee filters into wedges, but obviously you can cut them into rectangles, if you want them to look more commercial. Wedges are a way to use all of the filter. 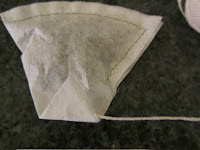 Larger filters will also work, and would be ideally suited for making your own full-pot tea bags. 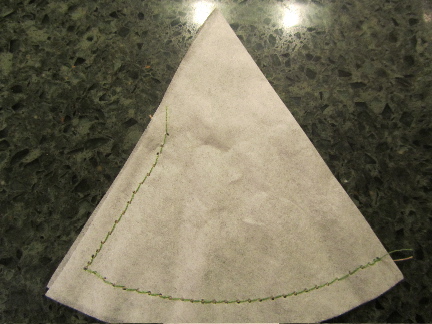 In these photos, I used bright green thread, so you could see my stitching. But for the rest of my bags, I use white, all-cotton thread. 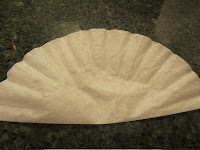 take 1 coffee filter (basket-type, for 4-6 cup maker), fold in half. You'll have a semi-circle. Fold this into thirds. Crease it well. 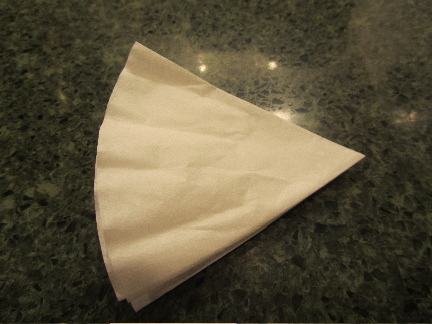 You now have a filter, creased into 6 sections. 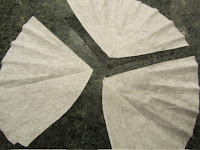 Cut the filter on every other section crease, into 3 pieces total. Fold each section into a wedge, along crease line. 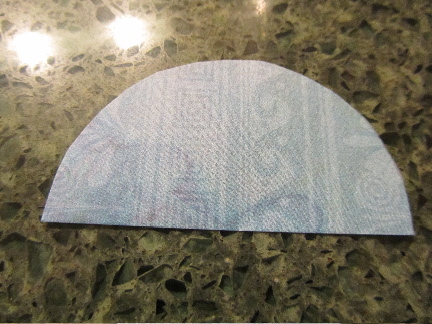 Stitch 1/8th-inch, or so, from edge of paper, along rounded bottom, and up one side, to 1 1/2 inches from the point of your wedge. 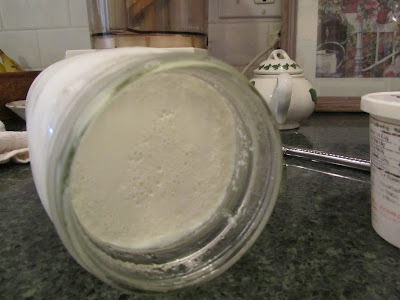 Fill with 1 1/2 to 2 teaspoons of loose leaf tea (I prefer 2 teaspoons). Turn the point down about 1/2-inch. 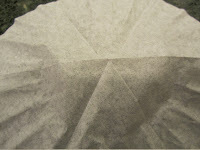 Place this knotted end, under the folded down point of the bag. 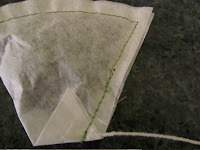 Finish your stitching along the unsealed edge of the bag, with the point down, and catching the string in the stitching. 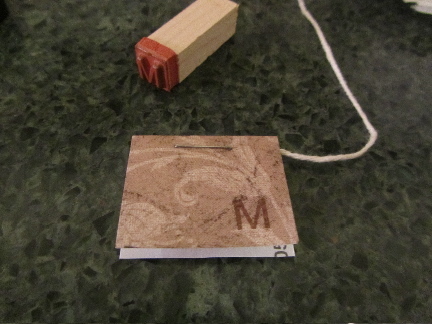 Complete with a tag on the other end of the string. Just a note: Coffee filters are not quite as porous as tea bag papers, so these bags "inflate", hold air, and float upon adding boiling water to cup. I haven't tried it, but I suspect that the bags would burst, if microwaved in a cup of water. I have seen some brands of tea bags do that. Just a warning, if you need to reheat your tea, take the bag out first. Next time, on As The Tea Leaf Curls, my homemade, reusable tea bags, totally free, and quick to make. Interesting. I never thought about making my own tea bags, but I'm not a big tea drinker. What a great idea for gifts, and you make it look so easy. thank you. They are fun to do, and quite easy. Way cool!I had no idea you could make these! Thank you, GTRicelli! Yep, and they're easy, too. I would never in a million years have thought of doing that! 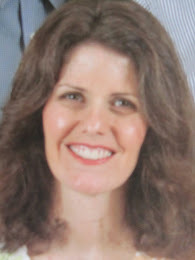 You are truly amazing - if Lili can't do it, then I reckon nobody can! you're too funny! I guess this is just evidence that I have far too much time on my hands in January! I think we both need a tutorial on threading a needle for the visually impaired!. 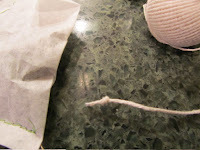 When I'm threading a needle, I can't even see that there is an eye to thread through, until I put some glasses on. But seriously, I just very recently found out that they make machines with automatic threaders. I think this is genius! Until I can have one of those, however, I'll have to stick with my old tricks -- giving the thread a fresh cut, waxing it a bit, and holding a scrap of paper behind the needle so I can make out the needle from the rest of the visual clutter. I had no idea you could make homemade tea bags. Since I don't have a sewing machine and hand sewing is about as appealing to me as sticking a fork in my eye, I'll just admire yours and stick with my store-bought teabags (I do have multiple versions of tea balls and a tea strainer, too, but your homemade tea bags would make a very fun and unique gift!). definitely, keep that fork out of your eye! Tea balls and tea strainers are good too. Thanks for the comment! I'm hoping to make some of that chai tea mix soon. Still looking around for a mortar and pestle. I like spicy chai tea, and often the blends are not quite as spicy as I like. This way I'll be able to make it just how I like it. Thank you! I use tea balls, too. Sometimes I like the convenience of bags. But also, I really like giving these as gifts, just to say, "I'm thinking of you" to a friend. Thank you for this tutorial! I made these last night and enjoyed a hassle-free cup of loose leaf tea this morning. I'm thrilled about now being able to take loose leaf tea to work. Also love that one unbleached coffee filter yields three tea bags! Your welcome! 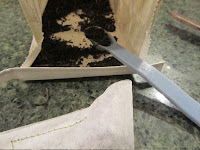 I really like the portability and ease of making my own tea bags for loose leaf tea, too. 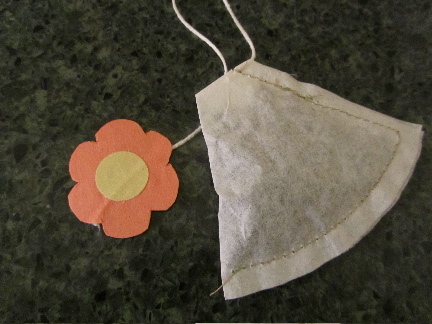 I usually bring a couple of these bags when traveling, so I can make myself a good cup of tea in my hotel room.